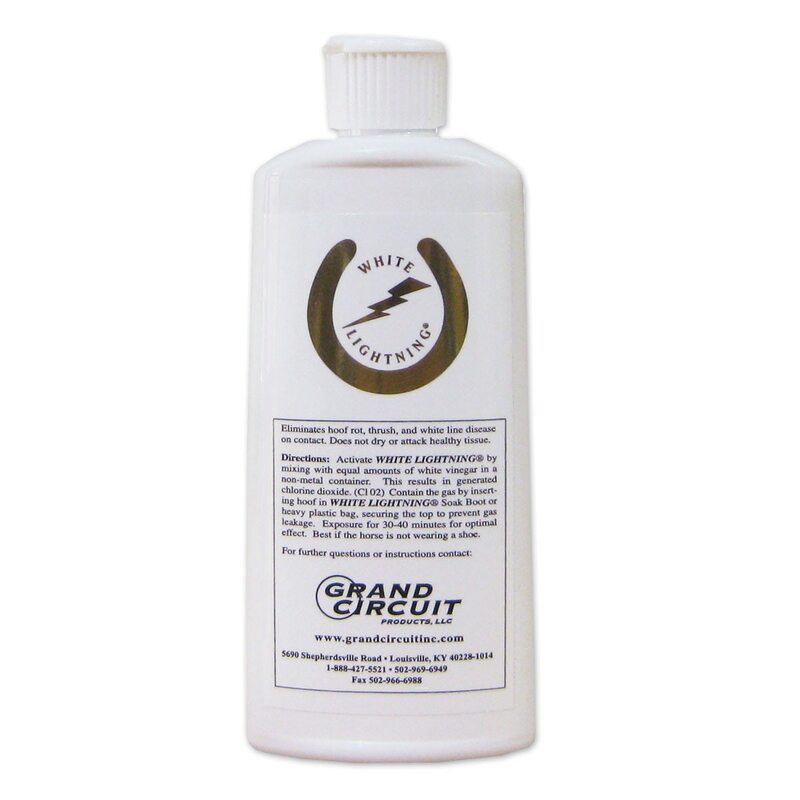 Proven to be highly effective in the treatment of thrush, hoof rot, and white line disease, Grand Circuit White Lightning is the hoof treatment you’ve been looking for. Simply mix with white vinegar and while your horse’s hooves are soaking, the solution will produce chlorine dioxide, which neutralizes bacteria, fungus, and yeast without drying out or attacking healthy tissue. Grand Circuit White Lightning is rated 4.7 out of 5 by 63. Rated 5 out of 5 by Cd9eventer from Great solution! I bought this to help with my boys progressing white line, that a few other methods just weren't resolving. Finally knocked it out with this stuff! Keeping a bottle in my supply closet from now on. Rated 5 out of 5 by Tally Ho from Really Works! Before and after pictures of my mares hooves, with white line disease. I used it 5 times, it's a pain, but get everything ready first, I'm a pro at it now, Lol Highly recommend! Rated 5 out of 5 by JaimeB from Works great I’ve been using this for several weeks now to treat white line on my mini donkey and have had great results. Rated 5 out of 5 by Amacres from First line of defense against very tough white line issues. Rated 5 out of 5 by Janis from Works very well to cure white line disease Same set of bacterium causes it in horses/cattle/sheep/goats/llamas. Exacerbated by wet conditions. I have never diluted with water and it has only taken one treatment. Just one to one mixed with vinegar to release the chlorine dioxide gas into the closed hoof boot. Has taken one treatment only, used that way, soaking for 30 to 40 minutes per directions on the bottle. Those directions say nothing about adding water. Besides for horses, it also works on goats, llamas, and sheep which for me was what brought the bacteria to our pasture to start with. Rated 5 out of 5 by Harleymom from White lightening thrush Works great! Do need a soaking boot to use this product. Rated 5 out of 5 by HOSELOVER from WORKS GREAT! Bought this item as my horse had an abscess and my vet recommended I use it. Excellent product and it does what is supposed to do. Rated 5 out of 5 by Dakota from Works great! Best for healing white line disease. It works and is easy to use.